DVD's on Vegetable and Fruit Carving! Here is a collection of DVD's and other information all available on one Page. All DVD's are related to The fantastic Art of Vegetable and Fruit Carving! Take your pick. I have given direct links to the page of the respective sites so you can get all the information and details at a click of your mouse button! So why wait? Go out there and get them! Just click on the Title of the DVD or the Image and you will be directed to the relevant page. Enjoy! In this new fruit carving DVD, professional chef James Parker leads you to easily carve simple fruit and vegetable edible bouquets to garnish the table. Learn how to create two edible vegetable and fruit centerpieces with clear step-by-step instruction. You will find easy to follow step by step instruction on how to make beautiful fruit and vegetable carvings in this Fruit Carving DVD by Executive Chef Ray Duey. Watch as Chef demonstrates how individual carvings can go together to form larger arrangements. With 23 different carvings to wow your clients, this DVD can be used as a teaching aid for your students or staff, or just for fun. 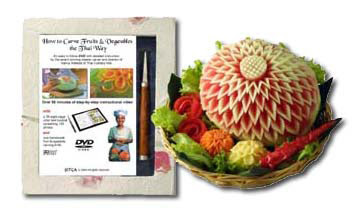 Vegetable and Fruit Carving VCD, Learn to Carve Step by Step.This English subtitled VCD* set includes an instruction book which further explains the carvings on the VCD. Carving instructions are given for cucumber, Thai eggplant, tomato and pumpkin. Also soap carving is introduced.Learn how to hold a carving knife properly, practice knife exercises and petal carving methods. Follow along step by step how to make tradtional Thai flower carving patterns including 'pook toom', blooming roses and carnations. Vegetable carvings are covered in the last VCD (see detailed list below). This home-study fruit carving DVD is the next best thing to joining the vegetable and fruit caving classes at the Samui Institute of Culinary Arts in Thailand. This DVD will allow you to learn the techniques needed to create stunning fruit and vegetable carvings. An excellent way for both amateur and professional chefs to acquire an impressive and valuable set of new garnishing skills. It is the perfect gift for a loved one who appreciates the culinary arts. In this fruit carving DVD, master Thai carver Pam Maneeratana, demonstrates how to create beautiful watermelon centerpieces. Watch as Pam reveals the traditionally secret, advanced carving techniques using just two paring knives to carve various watermelon centerpieces. Tutorials on Fruit Carving - an overview of Fruit and Vegetable Carving! A fantastic overview with links to other Fruit and Vegetable Carvings! I am sure you will have enjoyed the books and also will like these great DVD, and VCD on Fruit and Vegetable Carvings. My next post deals with specific Fruit Carvings. So keep a watch for this special post. This post will include - Carrot Leaf Carving, Watermelon Carvings, Carved Melon Bowl, Carved Carnation Bouquet...and many more fantastic Carvings.....! Have a Great time! Books on Vegetable and Fruit Carving! Here is a collection of Books and other information all available on one Page. 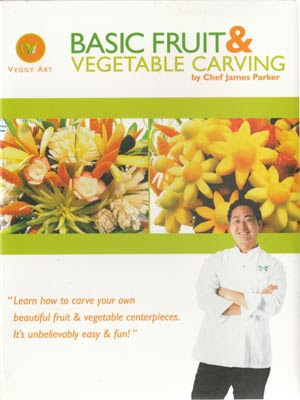 All books are related to The fantastic Art of Vegetable and Fruit Carving! Take your pick. I have given direct links to the page of the respective sites so you can get all the information and details at a click of your mouse button! So why wait? Go out there and get them! Just click on the Title of the Book or the Image and you will be directed to the relevant page. Enjoy! Vegetable & Fruit Carving Book-Complete Step by Step Vegetable and Fruit Carving! This beautifully detailed book guides you step-by-step through eighty-four exquisite fruit and vegetable carvings, all clearly presented with full-color photographs and practical, straightforward layouts. It is widely considered to be one of the most thorough and comprehensive fruit and vegetable carving books ever written, providing an eclectic selection of different carvings that are both elegant and uncomplicated. Variety of Flowers, Vegetable and Fruit Carving Book! As the title of this book suggests,the Variety of Flowers, Vegetable and Fruit Carving Book, is predominantly concerned with examining one branch of traditional Thai carving in detail, which is floral-type arrangements of carvings. 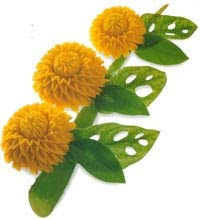 The flower carvings addressed here range from the delicate to the bold, interspersed with Thai mythical creatures and animals to enhance displays. 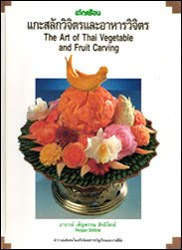 As with many of the fruit and vegetable carving books on offer at the Temple of Thai, this book contains beautiful full-color photographs, detailed illustrations and step-by-step guidelines to help readers accomplish even the most complex of the featured designs. In this gorgerous carving book you will find detailed insturctions for carving fruits and vegetables, including Pumpkin, Papaya, Taro, Gourds, Watermelons and others! This carving book is unique in its complete coverage of presenting Thai food with exquisite carvings and it is essentially two books in one. Written by fruit carving expert, Penpan Sittitrai, the first part of the book, Thai Vegetable and Fruit Carving focuses entirely on step-by-step carving instructions, each with their own corresponding full-color photographs, detailed instructions, and sketched illustrations. This advanced fruit carving book covers in detail how to carve papaya. The Thai author uses varying ripenesses of the fruit to achieve incredible classical Thai carvings of flowers, bouquets, flower vases, boats, swans, birds, baskets, parrots and butterflies.In addition to the 39 carvings, the introduction includes how to carve 5 types of leaves, roses, butterflies and other types of flowers. 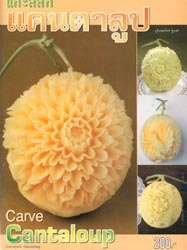 This advanced fruit carving book covers in detail how to carve cantelope melon. See a large image of this book.The Thai author uses the melon fruit to achieve incredible classical Thai carvings of mainly flowers (lotus, rose, zinnas, etc), flower bouquets, a flower vase, and birds. Each page is in both Thai and English. This vegetable and fruit carving book introduces the ancient Thai art of creating both intricate and simple food garnishes. It presents basic carving techniques with illustrations and step-by-step instructions for transforming common vegetables into decorative flower arrangements. Learn to carve pumpkins into ornate floral patterns in the classical Thai-style. These flowers are carved with a straight bladed knife and cut into old-fashioned style flower designs. This incredible advanced fruit & vegetable carving book written in Thai (no English) is carefully laid out with step-by-step photographs. 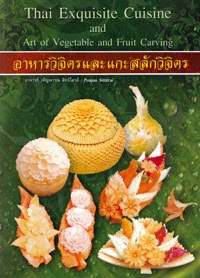 This book illustrates the highly-detailed traditional style of Thai fruit and vegetable carving, for which Thailand is famous. The book focuses on creating intricate carved serving trays, platters, bowls and baskets for the artful presentation of foods suitable for banquets, weddings, corporate events and dinner parties. I am sure you will like this collection, which I have compiled on one page to make it easy for readers to access. My next post deals with DVD's on Vegetable Fruit Carvings! Have a a Great Time!